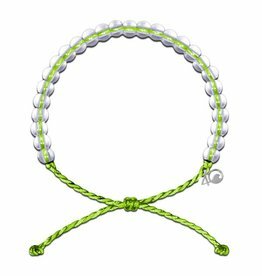 Made from recycled materials, every bracelet purchased funds the removal of 1 pound of trash from the ocean and coastlines. In less than 2 years, 4ocean has removed 2,315,465 pounds of trash from the ocean and coastlines. With these pillars as our foundation, we at 4ocean pledge to clean the ocean and coastlines one pound at a time. We utilize the latest technology to prevent, intercept, and remove trash from the ocean and coastlines. We have full-time captains and crews that are cleaning the ocean and coastlines 24 hours a day, 7 days a week. We strive to educate individuals, corporations, and governments on the impact that plastic has on the ocean. We host cleanups all over the world, both above and below the water, to raise awareness and change behavior. By giving ocean plastic a value, we are creating a new economy for the removal of trash. Each bracelet purchase will remove one pound of trash from the ocean & coastlines.